Summary: Thankfully though, drama, or lack of it, is not the make-or-break factor of Burton’s film. In the words of The Big Lebowski, “sometimes, there’s a man”. And if there was ever a director well-matched to a film project it’s Tim Burton with this new version of Alice in Wonderland. Sure enough, Burton’s trip down the rabbit-hole looks amazing, overflowing with inventive details in its characters and imagined locations, and pushing CGI possibilities to bring Lewis Carroll’s stories to the screen in a whole new way. Curiously though, this Wonderland lacks drama, and Burton’s seemingly inexhaustible visual imaginings can’t quite hide the film’s narrative shortcomings. 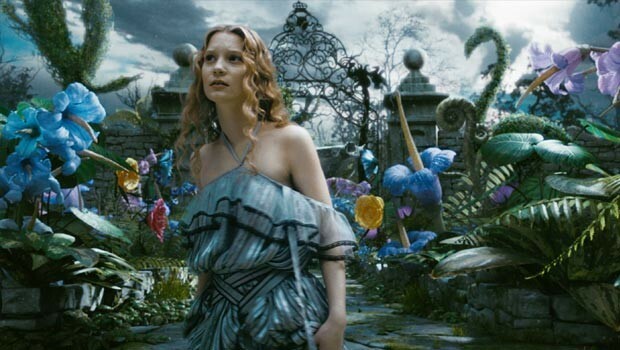 In this version of the story, written by Linda Woolverton, Alice (Mia Wasikowska) is in her early 20s and has forgotten Wonderland; the only evidence of her visit there as a young girl is a dream that troubles her every night. After informing us through a little scene-setting preamble that Alice is about to be forced into marriage with an insufferable bore, Burton brings in the more familiar story elements; the white rabbit, Alice’s tumble down the hole, ‘drink me’, ‘eat me’ and then Wonderland itself. Or more accurately, Underland; “wonderland”, we learn, was a mis-hearing by the 8-year old Alice – this world is more clearly geographically defined, in relation to ours, than we had previously known. It turns out that Alice’s return has been foretold, and there is hope amongst the citizens of Underland that she could be the one to slay the dreaded Jabberwock, and return the power of rule from the decapitation-obsessed Red Queen (Helena Bonham Carter) to her floaty, peace-loving sister, the White Queen (Anne Hathaway). This being a Disney story, there’s never any doubt as to whether Alice will take up the sword and ultimately prevail, but would it have been too much for Burton to have added some suspense, some danger with a little edge? The climax, when it comes, is an epic battle that’s become a too familiar sight in many recent blockbusters, and it feels particularly out of place in this hitherto quirky world. Thankfully though, drama, or lack of it, is not the make-or-break factor of Burton’s film. Burton’s visual creativity has always been most evident in macabre settings, and Carroll’s stories’ dark undertones – the awful reign of the Red Queen, the air of madness that pervades everything in Wonderland – prove fertile ground for his unique imagination. The look of the film is assuredly fantastical, with very effective CGI sets making Underland something halfway between photo-real and cartoon. This works well, and is particularly impressive in IMAX 3D, but it is the reinvention of the story’s familiar characters that is the most impressive of Burton’s achievements. The Red Queen with her oversized head, played brilliantly by Helena Bonham Carter, Johnny Depp’s sadly self-aware Mad Hatter and the creepily endearing Cheshire Cat – perfectly voiced by Stephen Fry – are all true to their literary roots, but given a fresh twist that means meeting them here again is hugely enjoyable. Through a combination of excellent casting and carefully highlighted details of behaviour, even characters making very brief appearances make a strong impression. If Burton had given that same attention to detail to the telling of the tale, this would have been a sure-fire classic. He treats the eyes and tickles the funny bone, no doubt, but the heart and mind are left wanting.